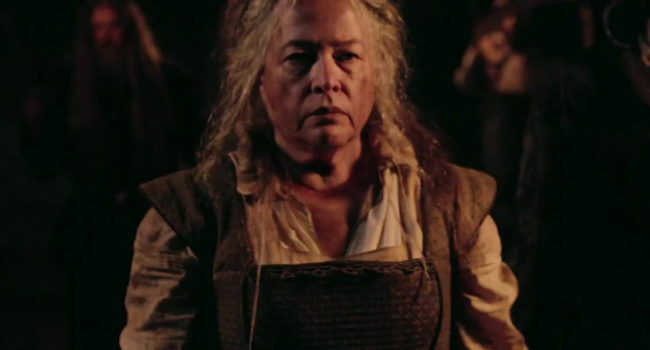 Played by Agnes Mary Winstead (Kathy Bates) in American Horror Story: Roanoke, The Butcher is a centuries-old bloodthirsty woman responsible for the deaths of the original Roanoke colonists before taking her own life. She still haunts the land, demanding the bloody death of anyone who dares to settle there or wander in her forest. Agnes plays The Butcher in a modern-day horror TV reenactment about one couple who faced The Butcher and lived, but Agnes quickly becomes just as insane as the original Butcher. The Butcher wears traditional colonial garb stained in dirt, mud and blood. 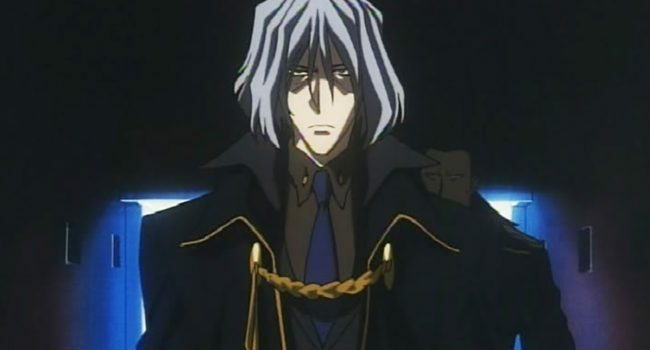 A member of the Red Dragon Crime Syndicate and nemesis of Spike Spiegel, Vicious is the main antagonist on the anime TV series Cowboy Bebop. He is a traditional villain: heartless, cruel and violent. He and Spike began as partners in the Syndicate, but when Spike began an affair with Vicious’ girlfriend Julia the two became bitter and life-long enemies. Vicious dresses all in black with a giant black bird on his shoulder and chin-length grey hair. In the movie Cowboy Bebop: Knockin’ on Heaven’s Door, Elektra Ovirowa previously served in the Mars Army Special Forces in the War on Titan. During the war she started a romance with Vincent, the antagonist of the entire Cowboy Bebop series and movie. Eventually joining forces with Spike Spiegel and the rest of the Bebop crew, she works with them to stop Vincent from eradicating the entire population of Mars. She is a tough, independent, serious woman who wears a black outfit with a red leather jacket. A soft-spoken, polite, kind girl, Hinata Hyuga appears on the surface to be ill-suited to the life of a ninja on the anime TV series Naruto. She is the heir of a powerful and wealthy clan, but they disowned her because of her meek disposition. Once she joins Team 8 and meets Naruto, however, she begins to find her confidence and develop her exceptional skills. In Part 1 of the series she wears her hair in a short bob and covers up in a tan coat and dark pants. Sew on a thick trim of white fur to the jacket and paint on the leaf patch for the full effect. Julia is a member of the Red Dragon Crime Syndicate and the beautiful blonde lover of fellow members Vicious and Spike Spiegel on the anime TV series Cowboy Bebop. Originally with Vicious, she starts an affair with Spike that causes Vicious to spiral into a violent rage, resulting in Julia abandoning Spike for his own safety. They meet later in the series in a whirlwind of events that culminates in the series finale. Her outfit is simple: a black latex leotard and luscious blonde hair with a pistol and sunglasses. In the anime TV series Naruto, Gaara is a ninja-in-training from the sand village Suna and, at first, the rival of titular character Naruto. He is a dark, solitary boy who grew up alone in his village because he carries within him the powerful and monstrous One-Tailed Shukaku. Because of this he vowed to live for himself alone, killing those who crossed his path. In Part 1 of the series he wears a black outfit with a white sash and carries his signature sand gourd on his back. For his brown sash, use a piece of thick fabric for the main part and then sew on stripes of faux leather with a silver buckle at each end. A member of legendary ninja Team 7 on the hit anime series Naruto, Sakura Haruno is a sensitive, kind, slightly wacky girl with a crush on fellow teammate Sasuke. She is the smartest of the bunch, but as a counterbalance requires the most extensive physical training to catch up to her teammates – which she handily does. This guide covers her outfit for Part 1, a red quipao dress and shorts appropriate for ninja training. Neji Hyuga believes himself to be a rare prodigy and exceptional ninja among the young ninjas-in-training on the anime series Naruto. Unfortunately, he was born into a branch of the clan that must serve the main house, and so feels shafted by fate. Because of this he acts out against the main house clan members and views those with less or different talents as ‘weaker’ than himself. In Part 1 of the series he wears a bland beige and grey outfit with long brown hair and his clan’s pale white eyes. For the top, crop the sleeves of a zip-up hoodie and buy patches of similar color to sew on overtop. In the anime series Blood+, Saya Otonashi is one of two twin queens of the vampire-like Chiropteran race. She, unlike her sister Diva, was raised to be human and exhibits compassion, empathy and kindness. After accidentally releasing the bloodthirsty Diva into the world and loosing her own memories, Saya lives as a regular human for a year before an event triggers her natural Chiropteran abilities. As she slowly regains her memories, she vows to end the threat of Diva and the entire Chiropteran race once and for all. This guide covers her earlier schoolgirl outfit, complete with katana and red eyes. In Blood+, Diva, named by her older sister for her beautiful voice, is one of two Queens of the Chiropteran vampire race. While her sister Saya was brought up in luxury, Diva lived locked in a tower alone with rags for clothing. She developed a cruel, vicious personality and a deep thirst for blood. When Saya accidentally released her from the tower, Diva showed zero compassion for humans, delighting in drinking their blood. She and her sister then begin an epic feud that lasts hundreds of years. Diva is differentiated from her twin sister by her blue eyes, long hair and simple white gowns. For the blue trimming, sew some thin blue ribbon onto the white dress.